Before you can understand the Romanian people, you should learn a bit about how it was born.The Romania ethnogenesis myth, also known as the Daco-Roman descent myth, explains the origins of the Romanian people. The Romanians are the result of an ethnic mixture, with two predominant components: the Thracians with their Geto-Dacian branch and the Romans. 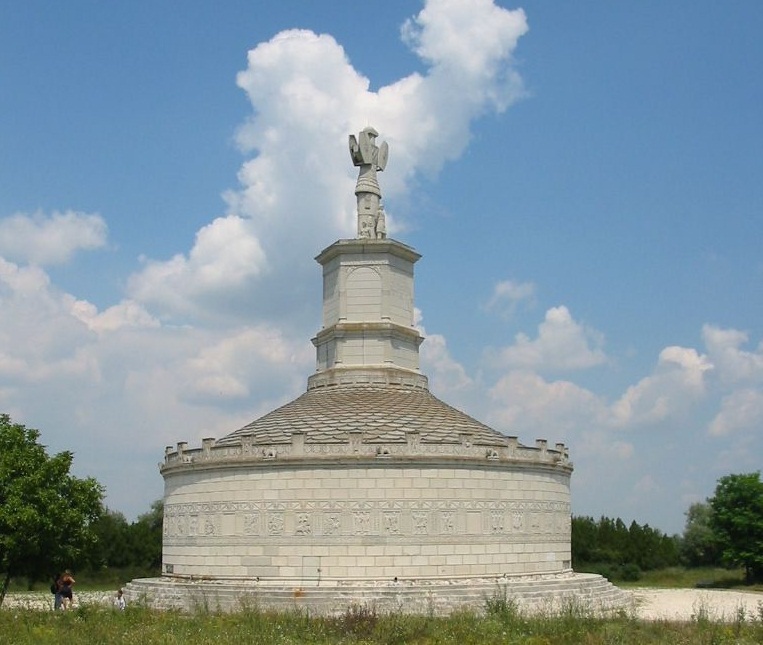 The famous monuments Trajan's Column in Rome and the Tropaeum Traiani in Admaclisi (Romania, Constanta County - in pic) depict the triumphs of the Romans over the Dacians. Dacia expanded on a wide region, bordered South by the Danube, East by the Black Sea and Nistru river, North by the Carpathians Mountains and West by Tisa river. Dacia’s natural resources were gold, iron, cooper, lead and silver. The Dacians made various handcrafted items such as jewelry and other gold items. That explains Roman Empire’s initiative to conquer Dacia. Before being integrated into the Roman Empire, the Dacian society was divided into two classes: the nobles called tarabostes or pileati and the common people called comati or capillati. The main occupations of the Dacians were agriculture, beekeeping, viticulture, ceramics and metal crafts. Dacians believed in many gods. Only a few of them are mentioned in ancient literary sources. The most famous character is Zalmoxis. He appears in several ways: as priest of the most glorious God, slave of Pythagoras, prophet, magician, quack, philosopher, legislator and king. Gebeleizis is a god that has raised many historiography debates. He is mentioned only in Herodotus' “History”. He was depicted as a handsome man, sometimes bearded, and thunder and lightning were its manifestations. Bendis was the goddess of marriage. She is represented with a pike in her left hand and a sacral cup in her right hand. The Dacian language was spoken by the inhabitants of Dacia and belongs to the Indo-European language family. Mixed with Latin during the Roman cultural assimilation, the Dacian language has disappeared, but some words in the Romanian vocabulary have Dacian roots. For example: prunc (baby), mos (old man), copac (tree), buza (lip), grumaz (neck), gard (fence), strugure (grape) , mazare (pea), balaur (dragon), a rabda (bide), a speria (frighten), bucuros (glad). Several archaeological discoveries became proofs for the existence of the Daco-Roman civilization on the current Romanian territory. Sarmisegetusa is a complex of sanctuaries situated in the Mountains of Orastie from which the most remarkable are “Sanctuarul Mare Rotund” (Big Rounded Sanctuary) and “Soarele de Andezit” (The Andesito Sun). Sarmisegetuza was the capital of pre-roman Dacia. Is an interesting place to visit for a weekend. The ruins of Ulpia Traiana Sarmisegetuza stand for the most interesting touristic attraction in the area, offering the tourist the image of a Roman city. You can get here using the national road DN 68 Hateg-Caransebes, or by train, following the route Petrosani-Subcetate or Simeria-Subcetate. The Ovidiu’s Statue is located in the center of Constanta. The Latin poet was exiled in Tomis in 8 AD, where he died after 9 years. It was in this place that he wrote his “Sad poems” (Tristele)and the “Pontics. (Ponticele) His statue was made by the sculptor Ettore Ferrari. Next week we'll discover together a bit of the medieval history – the medieval states which went to become today's Romania and whose names were carried on into the current regions of Romania: Moldavia, Transylvania, Muntenia and Dobrogea.